These Candy Apples, from Tudor, a leading manufacturer of school recorders throughout the country, are 2 piece transparent soprano recorders that not only provide eye-candy, but sound great too! Each recorder includes a bag. 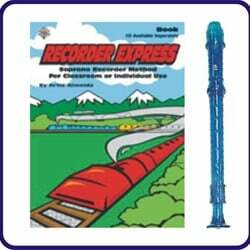 Recorder Express is the track to becoming a great recorder player and having fun! More than 120 folk, pop, and original songs and exercises are included as well as technique tips and beginning music theory. Notes in the order taught: B, A, G, C, D, Low E, Low D, F#, Low C, F, High E. Levels one and two are covered in this one edition. This method was well-conceived and thoroughly tested by master teacher, clinician, and professional recorder player Artie Almeida.